This red cabbage salad is an attractive, colorful combination of ingredients. 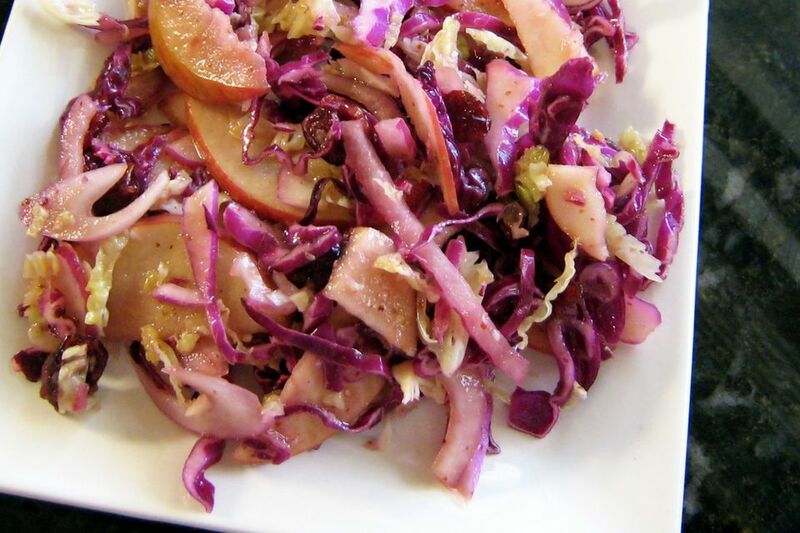 Thinly sliced apples, dried cranberries, and optional toasted pecans add delightful flavor and texture to the cabbage. If you don't have dried cranberries on hand, raisins or currants may be substituted. The pictured salad was made with both red and green cabbage, but you may use all red cabbage if you'd like. Use sweet, crisp apples in the salad (e.g., Gala, Fuji, Honeycrisp, Red Delicious, Golden Delicious, Cortland, Braeburn). The homemade salad dressing is a lightly sweetened combination of vinegar, honey, olive oil, and Creole or whole grain mustard. It's an excellent salad to serve with just about any meat or poultry. The salad goes particularly well with pork chops, pulled pork, or ribs, a pork loin roast, sausages, and baked ham. In a small bowl, combine both kinds of vinegar with the mustard; whisk until well blended. Gradually whisk in the honey and olive oil. Wash the apples; leave them unpeeled or peel if desired. Core the apples and cut them into quarters. Thinly slice the quarters crosswise. Alternatively, cut the apples into wedges and thinly slice the wedges. In a large bowl, toss the apple slices with the lemon juice, both kinds of shredded cabbage, and dried cranberries, if using. Add the prepared honey mustard dressing; toss to coat the ingredients thoroughly. Add salt and freshly ground black pepper, to taste. Chop the toasted pecans or walnuts coarsely, if using. Set aside. Refrigerate the salad until serving time; add the toasted nuts and toss again just before serving. Oven: Heat the oven to 400 F. Spread the pecan halves out in a single layer on a baking sheet. Toast in the oven for 4 to 6 minutes, turning halfway through. Stovetop: Scatter the pecans in a dry skillet and place the pan over medium heat. Cook until lightly browned and aromatic, shaking the pan and turning frequently. Immediately turn them out onto a plate to stop the cooking process. For the very best flavor, plan to prepare the salad at least 2 or 3 hours in advance. Cover the bowl and refrigerate until serving time. Toss the salad again just before serving. For some smoky flavor, feel free to add about 1/4 cup of crumbled cooked bacon or garnish the salad with crumbled cooked bacon.